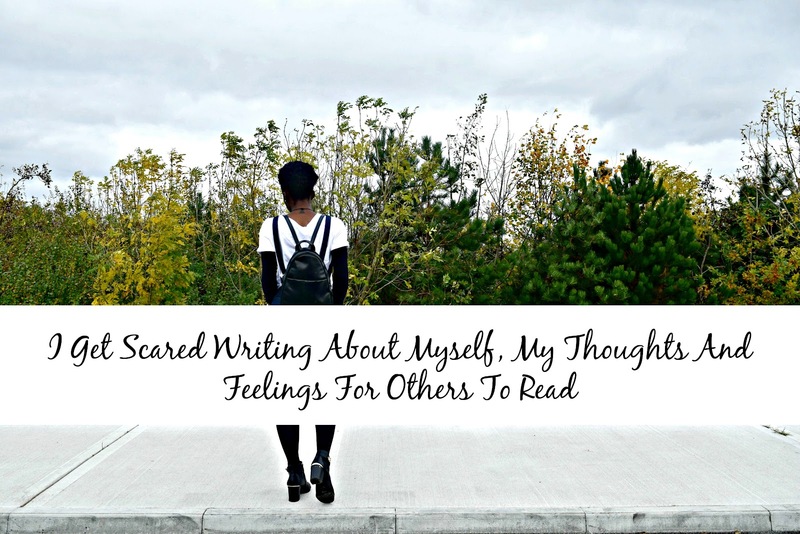 I Get Scared Writing About Myself, My Thoughts And Feelings For Others To Read | Albatroz & Co. So lets get one thing clear, I haven't posted on here in a while ( two weeks) , not because I've been busy ( which I have), not because I've ran out of things to talk about ( because I haven't) and not because I don't care who's reading my posts ( because I do. I thank my regular readers, some I hope consider me as much a friend as I do them). I haven't written anything in the last while because I haven't wanted to. No matter how often I say that I want to write for me and me only and whoever connects with it I always find myself circling back to one thing. Is there really no blogger out there who doesn't care about their numbers, even a little? I find that hard to believe. Do you not feel a little downtrodden when something you put so much effort into just doesn't to quite reap the results you wanted? BUT if I am being completely honest the thing that frustrates is not my numbers but the fact that I cared so much about something so trivial. Yes I'd love for people to come across my work, connect with it and keep coming back and I KNOW I have people out there who do ( and I love you all for it ) so why how do I keep falling into the numbers' prey, comparing myself to other bloggers and their success. Why do I not focus on producing great content that people will want to come back to, making this space I've put so much into my space? When you start out blogging, no matter what category you intend to write for, the first fears always run around who will read your blog. Most specifically the people you know who will read it because let's face it, it is easy to open up on a computer screen to someone on the other side of the world when you know there's no chance of running into them at the supermarket or the bus stop the next day. But what about your friends and family? And the people that don't know you so well? I've had a couple blogs before where practically nobody in my life knew of it's existence. Then came Albatroz & Co. where I made the conscious decision to open up a lot about the blogging part of my life to those in my life and if I'm being completely honest, I don't think I ever addressed the fear that came with the exposure and as such I never really overcame it. It rears it's ugly head every time I write something remotely personal whether it be a part of my life I find hard to discuss, feelings of stress, anxiety, depression I may be experiencing at tough times etc. As such I don't write about many, if any of these things here. I don't need to bear all my dirty laundry in public but if I wanted to I'd like to not give a toss who saw. Of course they say the people close to you are the ones least likely to read your blog because they already know what is going on in your life but just as I don't always talk about my personal life on the blog and the people in it, I can be just as closed off in real life too. It's a complex I have been working on the last while. I don't want to be a stranger to the people in my life. Ironically it's not even the people that know me whom I worry most about but those fleeting acquaintances who knew me in a different time in my life, be it a younger me, a more religious me or a more childishly naive me who spoke to everyone, hugged everyone and didn't seem to have any other emotional settings other than happy. And I know 'who cares what these people think?'. I shouldn't but some part of me does and sometimes that's the part of me that grips with fear when I try to imagine the people who read my blog and what they are thinking of it. Put it this way, imagine buying a packet of condoms for a friend at your local pharmacy and not caring what the sales assistant would think. I know some of you won't think twice about it but some of you may run of of the store when finished. I am a member of a lot of Facebook blogger groups, partly for the promotion I receive in them but also for the help and networking that they enable. However there are also a few groups where it seems everyone wants to share their successes and then sell you an e-book on how you too can achieve the same thing. In short, I am a part of some really self-demotivating groups on Facebook. But before I go any further let me just say, not all Facebook blogger groups are like this. I am a art of some simply FANTASTIC groups with lovely people who all support and encourage each other without trying to up-sell on every ounce of success. I only truly grasped how much of a hold such groups like these can have on you as a person and a writer when I found myself jumping at the chance to sign up for free e-guides on writing, promoting blogs, the right graphic style for me etc. Yes there is a fair bit of work needed to get your work out there not only so that your current readers get easy access to your posts but also to gain new readers and that is to be expected in any line of work that involves people however I had long passed the line of reason. Within a few months of becoming a member of such groups I started looking more at the number of reads, shares and comments I recieved on each post as opposed to the quality of what I was writing. I stopped focusing on what I wanted the reader to get from the posts and more on how I could bring them in. Thankfully I managed to not do anything drastic and change my brand or publish any click-bait posts but I am ashamed to say that my list of post ideas quickly became more like the screenplay for a really crappy soap than something I'd be proud to put my name on. And even though you guys my not have had a clue I apologise for selling my authenticity to the devil of numbers, even if it was for a while. Also note to self, don't sign up for any Instagram guides to boost your follow-ship. Complete waste of time. I'll take my 350+ organic following over spending hours commenting and liking pictures on profiles I don't even like or follow. And no I'm not saying I considered even for a second of buying followers 1) I'd never stoop that low. If I did I'd have to throw in my blogging badge and never claim to be original again and 2) I don't have that type of money to waste and why people do it is beyond me. You can cheat an algorithm but I won't be paying you to do it. I want to do well. Damn it. I've said it. Yes I want to create something that's beautiful and inspire and motivate others. I would love to be great but that's going to take time, maybe a lot of it, who knows but since I am being uncharacteristically open today I'd just like to put it out there that I want to create something worth standing up and shouting out loud for, not just with Albatroz & Co but in life. I know that can only be defined by my perception of what I call success and I'm saying now that I don't think I'm there or even close to it but I'm gonna chase it and be happy doing it. I'm going to cut myself off now because all the important stuff I wanted to get off my chest has been said and done and the rest will just have to be dumped on friends over hot cups of teas and late night chats. So what have I learned from writing this post and what I'm I going to do about them? 1) I do get scared of what people will think of what I am writing and I don't know if I'll ever get completely over it buuut I'd like to get to the point where it doesn't restrain me from writing what I want, with reason. And I guess the only way I am going to do this is to keep opening up not just to you guys but in real life too. 2) I need to stop paying so much attention to social media and numbers. Instead I'll do my best to provide better content for my readers and potential readers and get that out there as best as I can without being constantly glued to a screen. 3) I have ambition and I really don't want to lose it. I think I've spoken on here before about my fear of neutrality and nothing reeks of neutrality more than a loss of ambition. Without it what reason do you have to change? I'm genuinely interested to know if any of you have ever experienced any of what you just read ( whether as a blogger or just in general ) or if I'm just crazy and living too much in my own head. I guess coming out of this haze of being focused on such a thing as numbers, kinda losing sight of what I want generally in life, I'm still apprehensive about whether or not I've returned back to Planet Earth from Planet Ama's Overthinking Brain. You can also check out the posts I failed to promote while on blogging strike here, my last two adventures in Belgium: Bruges and Leuven. Wow, it's like listening to my own internal voice. I've only recently started blogging and my internal battle has been huge. The fear of my acquaintances (so much more than family) reading and quietly judging me can be very overwhelming. I just keep reminding myself that I need to focus on the good, the joy writing brings, the sense of achievement after getting that new post up and realise that those who mind, really don't matter. Thank you so much Tia! I'm glad to have confirmation that I am not alone hahah It can be such a lonely experience sometimes which makes it all the more harder too. And I love your attitude and approach to it. I hope you don't mind if I adopt it too?